As of yesterday, Currently, Kelsie is officially one year old! If I could share a big piece of birthday cake with you all, I would. It's been such a joy to see what started with a simple domain name morph and blossom into much more over the last 365 days. I've watched blogging become a type of ministry, readers unite over shared stories and vulnerability, and this small little corner of the internet grow into a community. I've learned how to run a weekly link party, apply for affiliate programs, and edit my own HTML code. But more than that, I've walked away with these 5 lessons- ideas that all bloggers (newbies or veterans alike) can be reminded of. 1. Choose community OVER competition. Like so many other areas of our lives, it is so so easy to look around the blogging world and be incredibly discouraged. Comparison can be hard. People will always have more page views, more Facebook followers, or more sponsored posts than you do. If others are succeeding, it's easy to think that you can't- and it's easy to shy away from "competitors". But I have found other bloggers to be the most amazing source of community and support. To truly succeed, you've got to have a solid blogging group or two and a community to share blogging life with. Once I stopped seeing other bloggers as people to "beat", I met so many wonderful and encouraging people! 2. Photos and titles can make or break a post. I learned pretty quickly that quality photos are necessary for any good blog post. If you really want to have quality photos, take your own (or find free stock photos), and then create your own labels or titles on your pictures using Canva, Picmonkey, or Photoshop. Let's be honest, you've got to pull people in with your keywords, titles, and pictures far before you ever get them to read your entire post. Also, list posts (like this one) are the best! 3. There is always room to learn and grow in the blogging world. Holy. Smokes. There is a whole heck of a lot to know about blogging. HTML code, plug-ins, alt text for photos, Google Analytics, Pinterest plug ins, link parties, the list goes literally on and on. This can be intimidating at first, but the best approach is to focus on a few things at a time, and then learn a little more and master a little more as you go. Thankfully, there are lots of awesome bloggers out there who are happy to offer lots of advice and feedback along the way. Learning fearlessly is part of my mission, and I love how the blogging world provides for constant learning and growth that keeps me on my toes. 4. Maintaining a blog is a LOT of work. Find balance! Blogging is a lot of work, and can be very time-consuming. Sometimes you'll find yourself up super late, finishing a post or commenting on other blogger's content. It's worth it, but can be a little daunting sometimes. Since there can be so much to manage, you'll need to take breaks sometimes to avoid burnout. And guess what- the world will still keep turning! When we went on our 16 day European adventure, I didn't blog or touch social media at all. I prescheduled a few posts and things on Facebook, and enjoyed my time away. I also took a break from social media on my phone from Thanksgiving to Christmas. These times of rest were so valuable, and helped me be present in a world full with technology and looming blog tasks. 5. Be yourself, and don't be afraid to put yourself out there. The best blogs aren't necessarily the ones that promote the most ads or share the most sponsored posts. Instead, they are the blogs that are real and authentic and true to the author's heart. Otherwise, an audience will see right through your content. Figure out your mission and what drives you as a blogger, then come up with a statement for it. The story behind my tagline helps readers see what makes me tick, and why I'm here. You've also got to promote a little bit, without being ashamed. It can be scary to start a Facebook page or share posts on social media, but readers don't just show up overnight without any work. And when they do start to show up (or maybe they don't for a while), don't get too focused on the numbers. Statistics are great, but they aren't everything. Don't give up. If you'd like to see some of the top posts of the year, along with some fun video and silly photos, check out 2015: A Year in Review. I hope these lessons help you as you start out or continue to blog. I know I need to be reminded of them sometimes. Thank you to Aaron- my number one supporter! Thanks to anyone who has read, commented, liked, or shared a post (this includes you)- you make it all worth it and I'm so glad you're here! And thanks to my Alder Collective ladies- Abby, Cristi, Kayla, Ashlynn, Lisa, and Brandy- you rock! It's been a great year, and I'm excited to see what year number two brings! I'm linking up with A. Liz Adventures, Motivational Monday, Modest Mom Blog, Me, Coffee, and Jesus, What Joy is Mine, The Diary of a Real Housewife, Uniquely Unfolded, Grace and Love Blog, Running for Cupcakes, Momfessionals, Life in Leggings, Tell it to Me Tuesday, Bliss and Faith, Raising Fairies and Knights, Sweet Little Ones, Testimony Tuesday, Intentional Tuesday, The Painted Teacup, Twinkly Tuesday, Sitting Among Friends, Women with Intention, Waiting on Wednesday, and Quintessential Mommy. Congratulations on 1 year! Your blog is pretty. I'll have to take a look around. I've been blogging for 2 years now and you are so right there is so much to learn! Have a great weekend. Thanks so much, Cat! Thanks for stopping by and checking things out! Number one is definitely the biggest blogging lesson I've learned as well. I have a really hard time seeing everyone as competitors, but I've learned that I need to support other bloggers and build a relationship with them if I want to succeed. Thank you Crystal! I totally agree! It sure does take a lot of work and commitment keeping a blog going and growing! Congrats on 1 year! You are so right, Chrissy! Thanks! hurray for one year! cant wait to continue reading! your blog is adorable! Community is a huge part of successful blogging. Learning how to not compare yourself to others is difficult but necessary. Congrats on year one of your fantastic blog and can't wait for many more to come! You are so right, Julia! Thanks so much! Yes to all of these! I definitely think the hardest for me to learn was that while, yes there is SO much to learn and work on, don't let it overwhelm you! Take it as a challenge adn something fun to learn - I've recently told myself to dedicate each month to a specific topic and earn and grow as much as I can on that topic in that month rather than try and do it all and burn myself out! Exactly, Morgan! I love that idea of dedicating it to a specific topic! Thanks so much, Trish! I'm looking forward to it too! Great and I agree with all of it! Congrats on your one year anniversary! You're so welcome, Ashlyn :) It was a nice break for sure. Excited to have you be a part of it all! Wow, what a blessing to have made it through a year of blogging. Your blog is beautiful, and I hope that you can just continue to improve more and more! It has been a huge blessing. Thanks, Emily!! Love these tips!Thank you - I am going to take a look over my blog on how to improve. Happy 1st bloggy birthday too! Thanks Kelsey! I love it too!! Great lessons - especially #1! I love the blogging community and writing for the passion and fun of it, not competition. Hi from the link-up and Happy Blogiversary!! Hi Brettni! Thanks for stopping by! 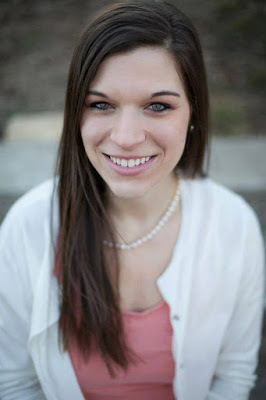 Happy I was able to discover your blog through the link-up + happy blogiversary! Wishing you and your piece of the Interwebs continued success. Congrats on your first year!! I also just had my blogaversary. Blogging has enriched my life in so many ways. And I am so happy to have found yours! These are all great lessons to learn! I wish you all the best in your future blogging years to come! Thanks so much, Justine! Planning to visit your city in March! Great post, I am learning as I go too, I really enjoy reading these types of post! Thanks so much, Carmen! I'm glad you enjoyed it! Agree with all of these! Happy blogiversary! Yes, yes, yes!! Thanks so much, Lauren! We need another coffee date soon! I love all of these. #1 is so true!! Thanks Kara! I totally agree!! Happy birthday to your blog! How exciting. I think blogging is so much fun. It is exciting, Leslie! And a lot of fun. Thanks for stopping by! Well thanks so much, Molly! It is a learning experience for sure! Congrats on your 1 year mark! I just started, but I went so hard at the beginning that I'm already forcing myself to unplug this weekend. Happy 1 Year! These are all great reminders as I approach my first anniversary. Thanks so much, Danielle, and congrats on your upcoming anniversary! Thanks so much, Farrah!! I love it too! YES to all of these especially one and two! 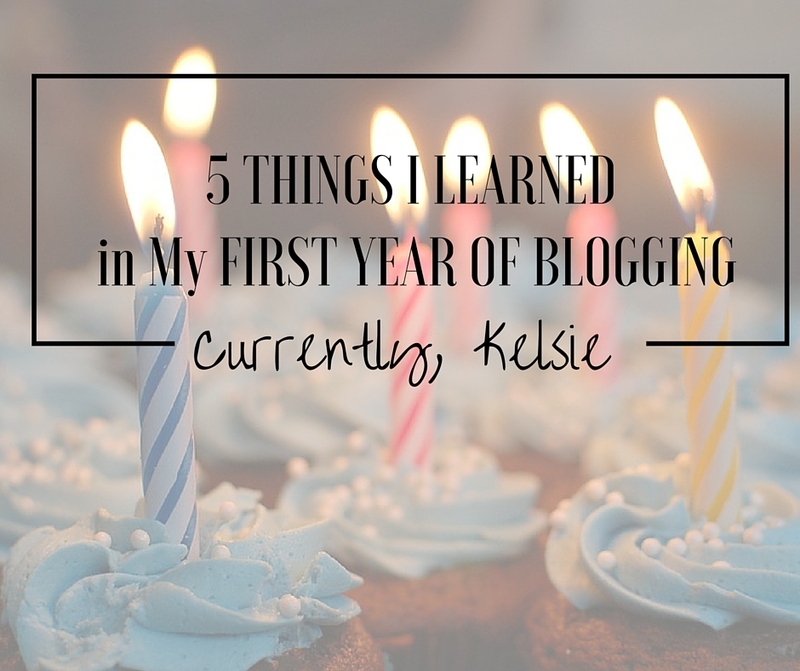 It's hard to believe you've only been blogging for one year... Congrats Kelsie! I love love love number one, the best lesson you'll ever learn ever !! Blogging is such a great way to connect with people we wouldn't otherwise do! I'm so happy that we've found each other via this blogging world. Wonderful tips! thank you so much for sharing. Just found your blog and am looking forward to subscribing so I can read what you post in the future. Enjoy the rest of your weekend! Thanks so much, Cassandra! I am excited to have you here :) Have a wonderful weekend! Yay for Blogiversaries! January is my anniversary month, too. It went by SO fast! I guess it's true: time flies when you're having fun! Yay Yay! So fun! Happy blogiversary to you too! As a newbie- this was helpful- such good reminders! Congrats on your one year and your blog is lovely! I'm so glad it was helpful, Carri! Thanks so much for your kind words! I am brand new to blogging! This was a perfect read! Thank you for sharing your experience! Yay! I'm so glad it was helpful! Best of luck as you start your blog! Congrats to you! #5 is so important. Being yourself on social media can be tough but that vulnerability creates great relationships with your fans and community members. Keep at it! Enjoy! Thanks so much, Alonda, and I totally agree!! Thanks for the encouragement! Thanks so much Chandler! I agree, they are good to be reminded of :) Thanks for stopping by! Happy 1 Year of blogging to you! Sounds like you've learned a lot in just the one year! :) I think the aspect of realizing that blogging is not about competition is really important. Just because someone else is really awesome at blogging doesn't mean that you're 'bad' at it. There's not a limit on the amount of awesomeness in the world. Thanks so much, Rachel!! I have definitely learned a ton. You are so so right! Thanks for reading. YES, YES, YES!! This is a fantastic. So with you on everything - love how you brought up how photos and titles matter! Well thanks so much Summer!! I think that photos and titles have definitely been more of my focus here in the last few months, and it has made a huge difference!! Thanks for reading. I'm learning many of the same things in my first year of blogging. And the learning is the fun part! There is always something new to learn and try. You are so right, Christa! It is fun to learn these things for sure! Amen to all of these! And I love that the only real tangible thing you included was the title and picture thing because blogging is such a community and it's so important to be yourself and so much of blogging is mental. Perfect! These are great lessons to have learned! Congratulations on your first year! Thanks so much, Branson, and thanks for stopping by! Well thanks so much Ursula, and congratulations to you!! Thank you thank you, Alex! I agree. It is much more than I thought at first! Kiara, thanks so much!! I am right there with you. This has been a lazier week for me! Yes to the title thing! I had no idea how important it was until I read an article on google ranking. I use a website called Write Better Headlines and it has been so helpful! Amen, Karin!! That is awesome- I'll have to check it out! Great List Kelsie. Sounds like you have had a terrific. I am with you blogging is so much work. What fun it is to have a community that will interact and grow with you. Thanks for posting up with us weekly at Sitting Among Friends. Have a great week. Thanks so much, Jaime. Thanks for having me! Thanks so much! I agree!! Congrats on a great year! I love your snapshot of the past year and tasteful approach to blogging. I appreciate your suggestions to fellow bloggers. Here's to another awesome year for you! Thanks Bridget! You are so kind. Thanks for the well wishes, and same to you! I'm entering my fourth month of blogging and this list is so helpful. Congratulations on your one year anniversary! Good bless your many years to come. I'm so glad it was helpful! Thanks so much, and I hope your blogging goes well- looks great! Thank you so much for sharing this! I'm a newbie and have been feeling overwhelmed with everything that comes with blogging. Congrats on making it through your first year! Yay, Shanna! I'm so glad it's helpful. Thanks so much! These are great tips! :) Blog titles are a constant struggle for me to come up with so I started smiling big time when I saw your comment! Thanks so much, Autumn. I agree- titles are key! I love this post Kelsie!! I just had to include it in my recent "blogiversary post" and included your post in a list of "bloggers offering real advice". Thanks so much for sharing! I am excited to check out your posts! Love all of these points! It's great to realize that the blogging community is so supportive and you'll be much happier if you choose that community over competition. Blogging is constantly teaching me new things, everyday. Congrats on one year!